Setting up meetings can be a pain, since they often require folks to send emails back and forth figuring out a time before finally sending off a calendar invitation to block everyone’s schedule. A New York startup called x.ai wants to simplify that with a helpful bot, and they just launched a product aimed at serving businesses. 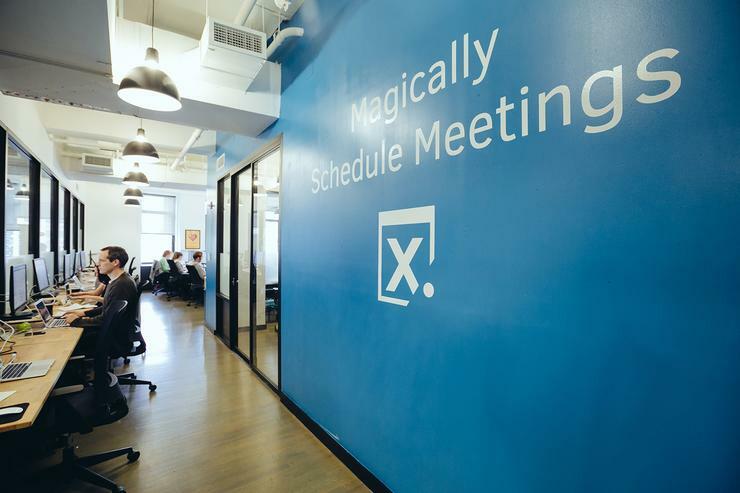 The service provides users with access to x.ai’s assistant, which can go by Andrew or Amy Ingram, to automatically set up meetings with people inside a company and help schedule time with folks who work elsewhere. It’s an extension of the company’s existing service, which is built for individuals. Both share the same core functionality: users can loop x.ai’s assistant into an email conversation by copying it on the thread, and the assistant will jump in to help figure out a time when everyone can meet. The assistant can analyze an email to identify parameters for a meeting, and then look through a user’s calendar to see what times work. Once it has a time to suggest, the assistant will reach out to other participants in the conversation to gather their availability and book a meeting. Business users get a few additional benefits: people inside a company can use the assistant to automatically schedule time with one another, without requiring any back and forth. Administrators will get a dashboard to manage and track employee use of the service, and companies will be able to customize the assistant’s signature and use a custom domain name for the email address needed to summon it. While that all sounds lovely, the service comes at a high price: businesses are expected to pay $59 per active user per month. To put that in context, Microsoft's most expensive Office 365 Enterprise subscription costs $35 per user per month. The good news is that x.ai won’t charge companies for people who don’t use its service to schedule meetings, even if those folks have access to it. X.ai CEO Dennis Mortensen argued that it’s worth paying so much for the service because of the productivity gains that users receive from it. The company’s hypothesis is that companies will see productivity gains from its service to offset the cost. There’s also the question of security and privacy. In situations when x.ai’s automated systems don’t understand input, the service will send human reviewers slices of an email to try and get the correct result. Those people are supposed to only see parts without context in such a way that would prevent them from seeing what’s being discussed, but that may not be an acceptable risk for some businesses. In order to use the assistant, people have to give it access to their calendars, too. However, Mortensen wanted to make clear that the company’s business is helping with scheduling, and it doesn’t resell user data to try and make a buck. There’s also another benefit to users on the security side: the assistant is designed to protect the calendar of the person it’s working for by default, keeping them from being scheduled for meetings they don’t want. It also won’t give away information about a user’s availability to salespeople or other social engineers, like a human assistant might. Right now, the assistant only understands English, so companies looking for other language support will need to wait for x.ai to add it. The startup already has a handful of customers signed up, including venture capital firm Work-Bench, and Assist, another AI startup.